Do you dream of weekends with the roaring surf, blue skies, and endless beaches? Nothing complements that dream better than this an FJ40 Land Cruiser like this one, restored and customized for some coastal cruising. When you have a classic 4x4 in a beach town, every errand becomes an opportunity to roll the back windows up, rev up that classic engine, and head into town. This FJ40 delivers on those simple pleasures, and looks good doing it. 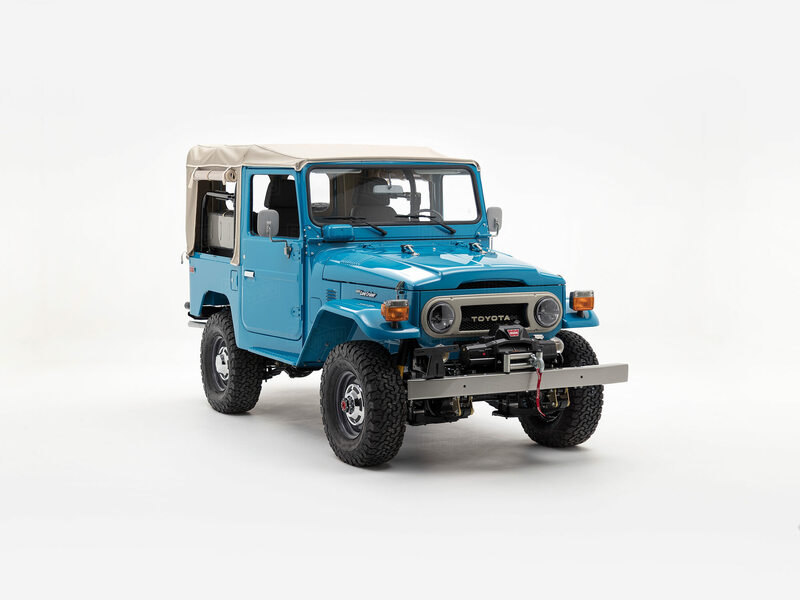 This rig is painted in Sky Blue, the rounded front grille is a nod to the FJ40’s early days, while the BF Goodrich All-Terrain tires, LED headlights, and Warn ZEON 8 winch stay true to its spirit of adventure. Under the hood of this FJ40, you'll find a newly rebuilt 2F engine paired with a 5-speed manual transmission. This classic combination is made all the more drivable with the addition of an upgraded Old Man Emu suspension, refreshed brakes, and, of course, power steering. All four-wheel drive components were completely restored and are ready to take on challenging terrain or adverse conditions. The interior cabin is a blend of modern features and classic design. Wrapped in gray vinyl upholstery, it features an exposed metal dashboard with retro pull-knobs and gauges. For your entertainment and comfort, you’ll also find climate control and a marine-grade entertainment system with Bluetooth.